The west end of Whitby Beach, North Caicos. Whitby Beach is probably the nicest beach on North Caicos. The ocean here tends to have the cleanest bottom, with only a few rocky patches interrupting the sand. Although this 3.5 mile beach is technically the busiest beach on the island, you’ll often have miles to yourself. Along with Hollywood Beach and Pumpkin Bluff Beach, Whitby Beach is one of the nicest beaches on North Caicos. Here you’ll find the largest continous beach on the island, white sand and clean water. Although most of the vacation rental accommodations on North Caicos are located on this beach, the area sees very few visitors and you’ll typically have much of it to yourself. The entirety of Whitby Beach is quite decent, however, the section at the small Whitby community centre and pier is the finest. Pelican Point is found at the mid-point of Whitby Beach. Here, a low rock headland emerges from the beach. A small snorkelling site is found here, and although it doesn’t compare well with the best snorkelling reefs of Providenciales, it is however interesting. The only other feasible beach snorkelling location on North Caicos is Three Marys Cays. More so than other beaches on the island, Whitby Beach does sometimes experience seaweed floating on the water and on the beach. If such are the conditions during your stay, we recommend checking out the nearby Pumpkin Bluff Beach or Hollywood Beach. When weather conditions are choppy, much of linear north coast of North Caicos, where all of the island’s beaches are found, will be affected. The only exceptions are the far eastern end of Hollywood Beach, and the west sides of Sandy Point Beach, as these sites will typically be sheltered from the constant eastern trade winds. 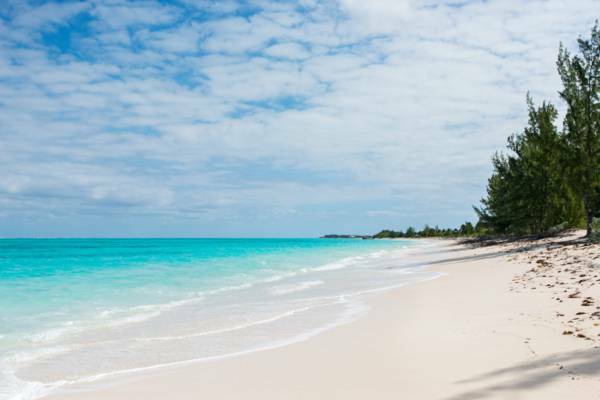 Due to its larger and more-varying coasts, there’s almost always a calm beach to be found on Middle Caicos. This access leads to the middle of Whitby Beach, but this spot is a bit rockier than other areas. A convenient beach access and parking area can be found here next to the Silver Palms Restaurant. Parking is a bit limited here but this access leads to what is probably the best section of Whitby Beach. Plenty of parking space and a pier can be found at this access on the eastern end of Whitby Beach. Last reviewed by an editor on 29 June 2017.